@Jeff: I don’t think that is a dialog balloon. It looks more like a narration block. True. Narration Block Contest then! I think we’ve done those before, but either way it should be fun seeing how that banana gets explained away. Pirate Peggy pointed the potassium pistol at the pug’s palm. 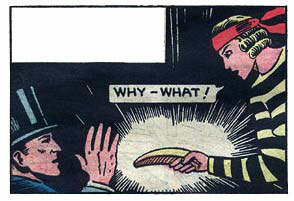 1. and then stripy the bandit pulls out a…wait is that a bannana??? 2. a shocked and confused Bannana-Lad wonders why his banna gun ain’t then realises his using his lunch!!! 1) Sir Allen found himself in the worst buglery/interrogation in the world. 2) We now return to “The Banana Bugler” already in progress. 1. Fortunately, Phineas has taken the patented Monty Python Self Defense Course, and can defend against a man attacking with a banana! 2. Wilson speaks his spell, and in a moment, the Mime Pirate’s banana will magically transform into a PISTOL! 1. And low, God did give upon the the Lady The Holy Banana, and she did exclaim in surprise. 2. And then, Magic Man, using his powers turn-you know what, this is just silly, who in the name of superman is going believe this! I quit! 1. Patiently the crime boss explained he needed a bandanna, not a banana. 1. The yellow beak proved she murdered Tucan Sam! 2. The banana, not wanting to be eaten, raises its shields. 3. I had to admit, the dame had “a peel”. 1. Suddenly, the radioactive banana bit her hand, giving her amazing banana powers! 2) SHe angerly realized that she had accidently picked up her daughters snack this morning, and sent her to school with a pistol. 3)She was confused why the magician wanted to make a banana split. 1. He explained how the phrase “with a bannana” could fit into any song. Try it out, it’s true people! Meanwhile at the Chiquita Banana Factory, things seemed to be going exactly as planned. All Shall Feel The Sting Of Bee-Girl! 3. Now let’s see what happens when we replace her gun…With a banana! The magician assured the bandit that, with this item, his victory over the Mario Kart championship was all but guaranteed! The Magician then realized to his dismay he was allergic to bananas. The banana’s silence proved that the magician was right…It is NOT peanut Butter Jelly Time. The Magician had fallen for the oldest trick in the book! HE FORGOT TO WATCH THE OTHER HAND! If Mrs. Oops-I-peed-on-my-prison-suit-lady simply looked into the eyes of her nemesis, she would have realized that the Banana blinded all who gazed upon it! John Wilkes Booth was already having a terrible day, but suddenly…! Yet no one saw the performance as the server had crashed. Now he must conjure a hammock for it.